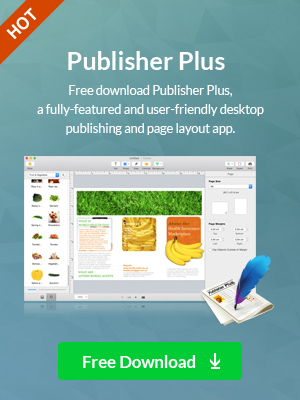 Launch Publisher Plus and start to make your own document. Launch Publisher Plus, the template window appears as below. Choose a template from 170+ deluxe templates to create deluxe and professional document. 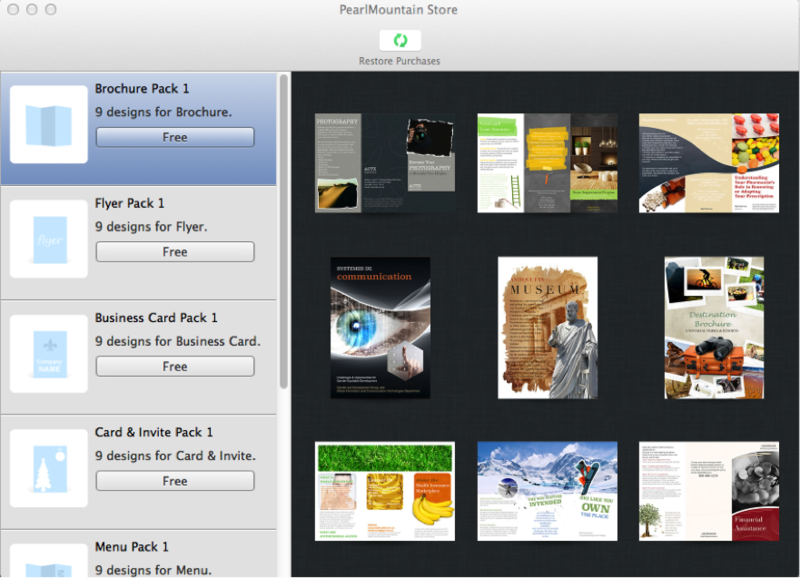 You can also click the Store button to download additional template package for free with your Apple Account. Click in the bottom-right corner to set Page Size and Page margins on the page inspector. Click Page Size combo box to choose the document size you need. Set orientation of the page by clicking the Landscape or Portrait tab as you wish. Input margin properties to adjust document margins under Page Margins inspector. 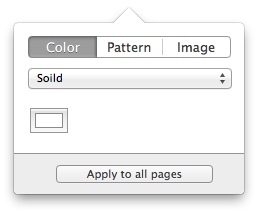 If you need to create a multi-page document, click to open page panel and then click button to add a new page. Click button to delete the selected page. You are free to rearrange the page order by simply dragging and dropping. Switch between different pages by clicking the arrow buttons at the bottom or clicking on the page thumbnail directly. You can copy elements (clipart, photo, frame, text, etc.) from one page and paste on other pages. Click Background toolbar button on the top of page to set background of your document. Click Color tab to fill the background with specified color. The fill type can be set as Solid, Gradient, and Advanced gradient. 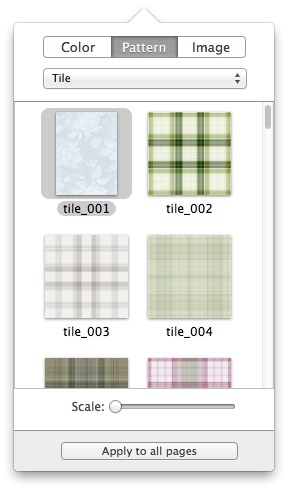 Click Pattern tab to fill the background with Tile and Stretch patterns. Choose your favorite background pattern in the pattern thumbnail list and you can preview the background instantly on current page. Click Image tab to select your own images as background. You can apply any favorite image as background with three modes of Tile, Stretch, and Fill. Click iPhoto or Aperture, etc. under LIBRARIES category on the left to add photos from iPhoto and Aperture, etc. directly. Click a folder like Pictures under the FOLDERS category to add photos directly from a specific folder on your computer. 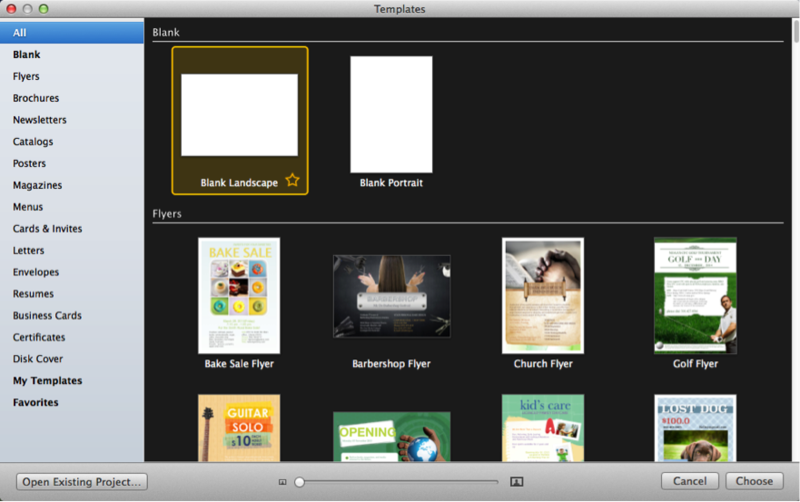 Open Finder on your Mac, drag and drop any additional folders here. You can preview every photo on the lower part of the photo list panel on the left.Drag and drop any photo to add it to thedocument. It support almost all formats like JPG, TIFF, PNG, GIF, PDF, EPS, AI, SVG, etc. Click button to show the Clipart list. Drag & Drop a clipart to add it on the document page. You can also search on the Internet inside the app. The clipart is arranged into several categories: Animal & Pets, Architecture, Art, Business and more. Scroll down to preview all clipart in the Clipart list. Click Text toolbar button on the top of page to add text in your document. 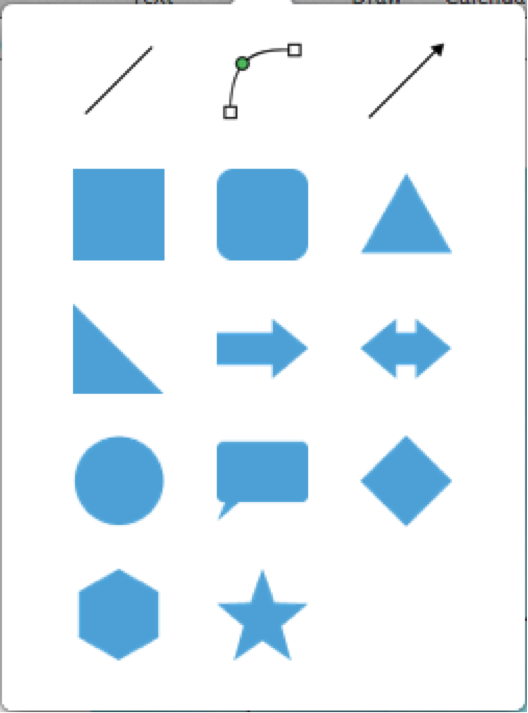 Click Shape toolbar button on the top of page, and select a preconfigured shape to your document. 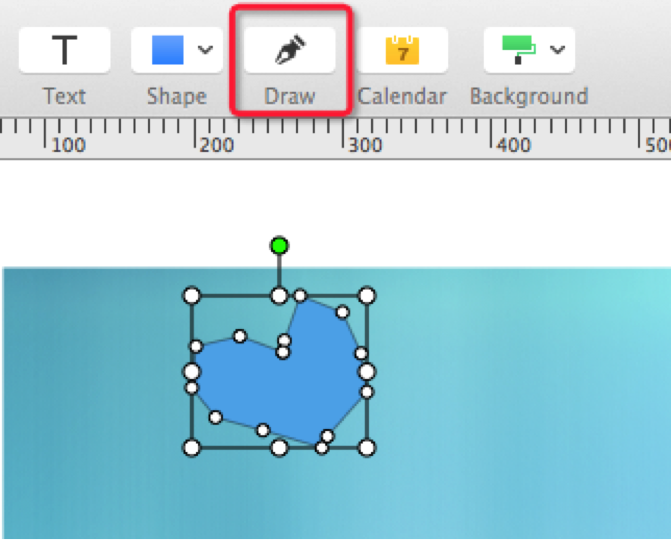 You can draw a custom shape by clicking Draw toolbar button to fit your needs. 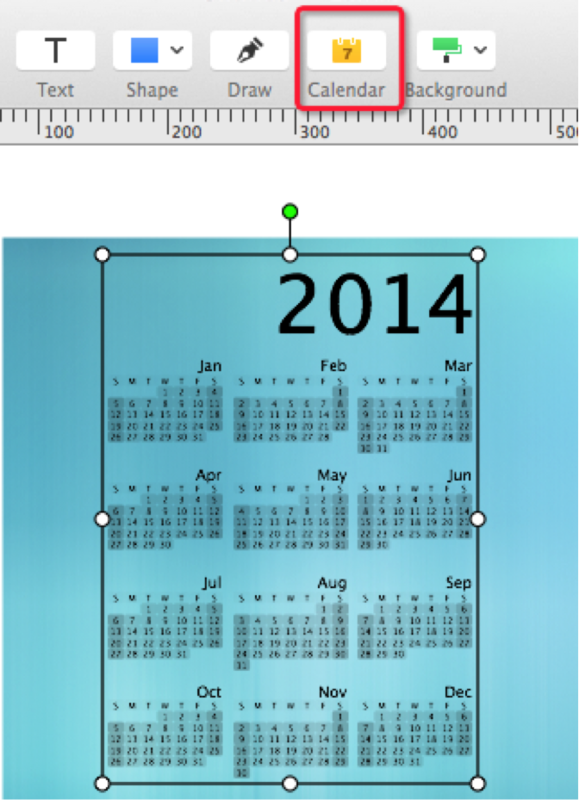 Click Calendar toolbar button on the top of page to add a calendar in your document. There are many preset object styles provided. You can directly apply them in just one click. Or click + button to set up any common used object style as you wish for easy and repeated use in later. Select an object, and set its Fill, Stroke,Shadow and Reflection under Style panel on the right. 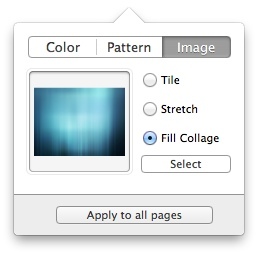 Check Fill to select a fill mode (Solid, Gradient,Advanced Gradient, Image Fill& Pattern Image Fill) to object. Check Stroke to set stroke type, color and width to object. Check Shadow to customize shadow settings like Color, Blur, Alpha, etc. Check Reflection to set a reflection to the object. Grab and drag the slider to adjust object Opacity or use the stepper control on the right of the slider. Select an object to arrange its Position & Size, Rotate, Flip& Mirror under Arrange panel on the right of window. Input Width and Height, etc. properties you need directly or click arrows button on the right of input box to set the position & size under position & size inspector. Click to Rotate object within 360 degrees. Click to Flip or Mirror the object. 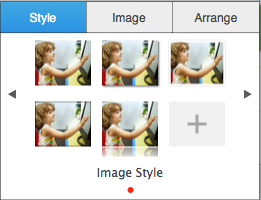 Select a photo, and apply any photo mask or frame by clicking Mask and Frame button under Image panel. Click Clear to eliminate mask or frame. Apply any photo effect under Mask and Frame by clicking on an effect. Click Original to remove photo effect. 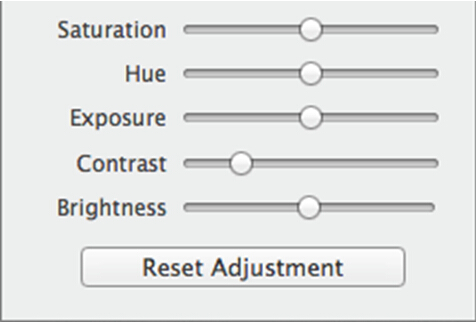 Adjust the image by simply grabbing the slider of Saturation, Hue, Exposure, Contrast and Brightness. Click Reset Adjustment to remove all the adjustments. Double click the text to edit it. And set Font, Margin, Columns,Spacing, Bullets & Lists,etc. on the Text panel on the right. 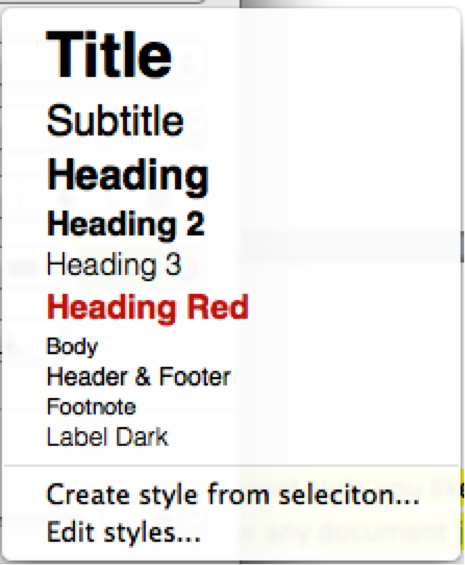 Click Styles under style tab to choose a preset style you like to directly apply to your selected text. You can also customize text styles for easy and repeated use in later. Select a text font as you like by clicking the Font combo box. Set style, size and color as you wish. Click the shortcuts to quickly settext formatsuch as Bold, Italic, Underline, etc. Set Alignment or Vertical Alignment to suit your needs. 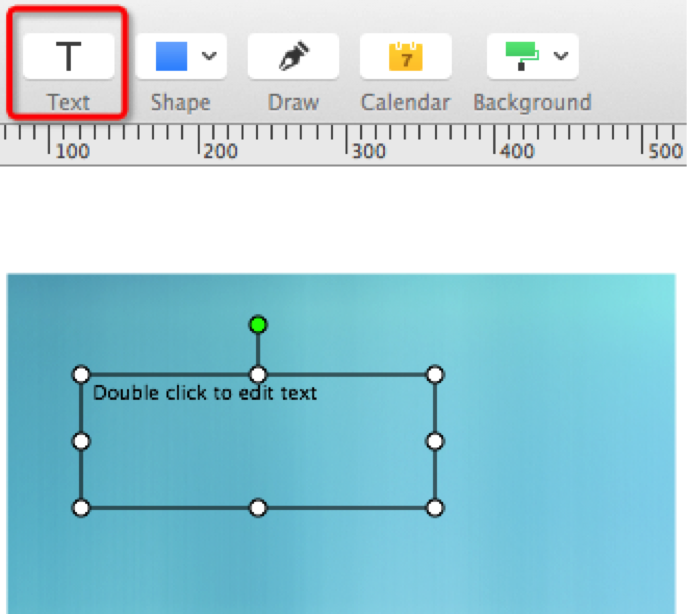 Set Margin for the text by grabbing the Width slider or directly input the width properties you want. Click the Bullets & Lists combo box to set the bullets or lists for your text. Add Columns for you text under layout tab on the Text Panel. You can easily change the number of columns, gutters and column spacing. Set Spacing of text by dragging the slider under Between Character, Paragraph Spacing, etc. to widen or tighten text space. Tips: Choose menu Edit->Bigger at the top of the screen, or press Command+ to increase the font size. Choose menu Edit->Smaller at the top of the screen, or press Command- to decrease the font size. Grab the crop slider to zoom in/out on the photo. Move the photo that you want to crop within its frame. The rest part of the photo will be hidden. You can click Reset to reset cropping, or Click Done to finish cropping. Click Print toolbar button to print the document directly. Make print settings such as Printer, Copies and Pages, etc. to suit your needs. 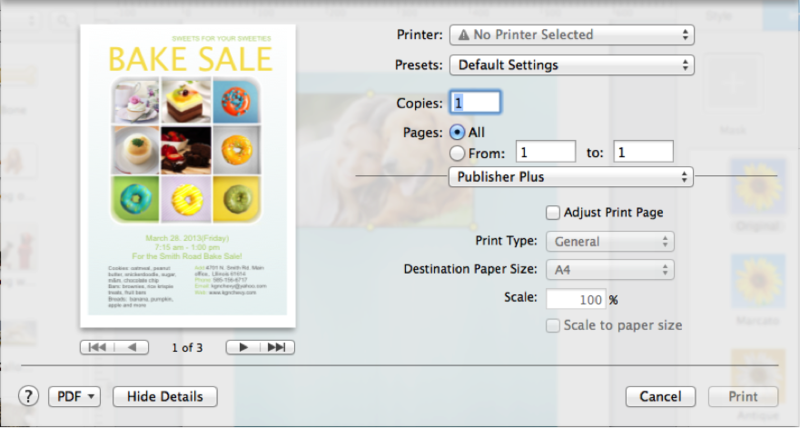 Check Adjust Print Page and then you can set the Print Type, Destination Paper Size and Scale. Click Export toolbar button to export your document. Type a name for your document. Specify a destination folder on your disc. Choose the Pages range of document you’d like to export if you created more than one page. 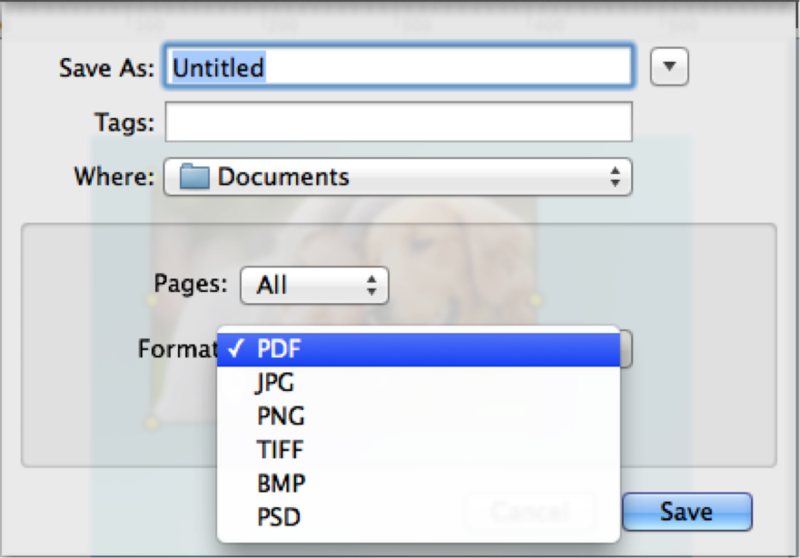 Select the document Format that you want to export. 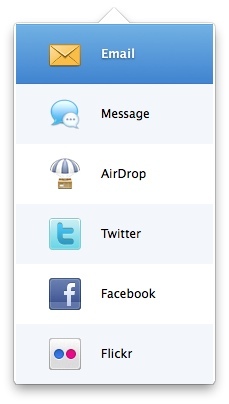 Click Share toolbar button to share document to Email, Message, AirDrop, Twitter, Facebook, Flickr on Mac OS X 10.8 or later. For Mac OS X earlier than 10.8, click Email or Facebook toolbar button to share document through Email and Facebook directly.